What Happens When You Click? I once heard a presentation by one of IBM's top sales reps. He said when people asked him "How do computers work?" he always told them "Just great!" The Internet is a similar story, but I think AskBob readers, since they are smarter and better looking than the average Internet user, should have a better understanding of what happens when you click a link or send an email. “Internet” stands for “interconnected networks" because it's really a network of networks. The computers in your home or office are connected in a local network. That network is connected to another network operated by your Internet Service Provider (ISP). The ISPs network is connected to other ISPs’ networks. Those networks may be comprised of many different types of computers. That’s the hardware or physical view of the Internet. A variety of physical media can be used to make the connections: Ethernet cable, telephone or power transmission lines, radio signals (satellite or wifi), and beams of visible light (fiber optics) are all the same to the Internet. The key thing is that a medium be capable of transmitting information according to the protocols of the Internet. IP determines where data goes and how it travels; TCP makes sure it gets there quickly and intact. The Internet Protocol is the set of rules followed to deliver data from point A to point B on the Internet based on the destination machine’s IP address. TCP stands for Transmission Control Protocol; it is the set of rules followed to ensure fast, error-checked transmission of data between two points on the Internet. Here's a little history of the Internet, along with a brief summary of how it is managed today. ARPANET, the precursor to the Internet, was developed in the late 1960s and early 1970s. It was a cooperative effort of the U.S. Department of Defense, several universities, and private corporations. By the early 1980s, a set of standards for connecting diverse networks around the world was developed, and became known as the Internet. In 1992, The Internet Society was formed as a non-profit organization to provide leadership for the development and use of the Internet. The Internet Engineering Task Force (IETF), which operates under the auspices of the Internet Society, develops and promotes Internet standards and protocols. In 1998, The Internet Corporation for Assigned Names and Numbers (ICANN) was formed to coordinate the management of Internet Domain Name System (DNS), pursuant to an agreement with the IETF. The Internet Assigned Numbers Authority (IANA) is a department of ICANN that oversees IP address allocation globally, and manages the root DNS servers. "Where Wizards Stay Up Late: The Origins Of The Internet" tells the story of the origins of the Internet, based on interviews with the people who made it happen. Perhaps you've never heard of Bob Taylor, Vint Cerf or J.R. Licklider but after reading this book you'll want to thank them. Some other interesting history can be found at the Internet Society's History of the Internet page. A numeric IP address is similar to the address written on a postcard. Applying the rules of the Internet Protocol to an IP address should get data from the sending (host) machine to the one with that IP address. These addressing and routing rules are found in the Domain Name System (DNS). The browser sends “askbobrankin.com” to a DNS server along with a request: “What’s the IP address that corresponds to ‘askbobrankin.com?’” The DNS server consults its table and sends the answer, if it has one. If the DNS server can’t find the answer, it sends the request to a higher-level DNS server that has more names and addresses. The request keeps getting kicked up to a higher level DNS server until the answer is found, if it exists. In the whole wide world, there are only 13 “root” DNS servers that know every name and address pair; most DNS requests are resolved (successfully answered) at much lower levels. When your browser receives the correct IP address, it sends a request for Web content to that address using the HTTP or HTTPS protocol. (The latter specifies that certain security measures be taken to protect the privacy of communications; see below). When the Web server at that IP address gets the request, it collects the requested data and sends it back to the requesting browser’s IP address. So let me clear up a misconception (or at least a misnomer) here. You don’t really “go to” a Web page, and likewise, there are no “site visitors.” Web pages come to you in response to your browser's requests, just as packages come to you from Amazon in response to your purchase orders. To use the physical mail analogy, it's like sending a postcard from New York to Paris, asking for a picture of the Eiffel Tower. Someone in Paris receives that request, and sends back a postcard with the photo. You've gotten the photo of the Eiffel Tower, but you never actually visited Paris. A Web page may consist of thousands or millions of bytes of data. They don’t all arrive at once in one huge package. The data your browser requests is broken up into blocks of 1,000 to 1,500 bytes. Each block is packaged with header and footer information that specify where it’s going, what larger body of data it comes from, and where it fits in the jigsaw puzzle of blocks that will have to be re-assembled at the destination address. Data blocks rarely follow each other in single file over the same path from a server to the machine that requested them. Instead, each packet of data is sent along the path of least resistance (fastest speed) by each router that handles it on its way back to you. So that postcard in my analogy would actually be torn into bits, each labelled with the destination address, and then re-assembled upon arrival. The illusion that you are visiting a website in Paris, London or Rome is created by software. Or if you prefer, magic. Clarke's Third Law states: "Any sufficiently advanced technology is indistinguishable from magic." In theory, any data travelling across the Internet can be seen by persons who have access to the computers or routers in the local network or Internet backbone. On a public wifi connection, you are even more exposed, because everything you can see in your web browser or email program is also visible to others on the same wifi network. In practical terms, that means everyone in the same coffee shop, airport lounge, library or hotel. The answer is encryption. When the web address shown in your browser says HTTPS instead of HTTP, that means your data is encrypted before hitting the Internet. To anyone who might be "sniffing" it will appear as a random jumble of numbers and letters. The HTTPS protocol combines HTTP with a security protocol called TLS/SSL. Actually, TLS (Transport Layer Security) is a modern, more secure replacement for SSL (Secure Sockets Layer), but both are commonly used and so appear together. Using digital certificates and public key encryption technology, TLS/SSL first authenticates the destination server, verifying that it is indeed “askbobrankin.com” and not a malware-spewing imposter. Then an encrypted “tunnel” is created between the destination server and the requesting host machine, through which data is exchanged safe from eavesdropping. The math involved is mind-bogglingly complex, but that need not concern mere mortals. All the extra activity of authentication, encryption and decryption of data adds some overhead to an Internet communication stream and the machines on each end. The Web may seem a bit slower but the added security and privacy are more than worth the sacrifice. Using a secure HTTPS connection is pretty much standard for most websites these days. Most recent comments on "The Internet: How Does it Work?" Oh heck. It's just a series of tubes. That's a terrific succinct summary! And it does all that with just 0's and 1's! Nicely done, Bob. Good job. 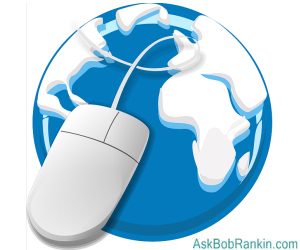 Thank you, Bob, for a very I formative article which answered my questions about the Internet. Just non-technical enough for me to follow. Good simple explanation. It would be good to explain in a way so people better understand the impact of net neutrality. A lot of people have a political view and want to avoid the true meaning. Although I do not have any political affiliation or leaning my understanding of the loss of net neutrality is as follows: The internet is another utility like water or electricity, nothing but 0s and 1s. Your PC decides what all those 0s and 1s make. But with the lose of net neutrality, you may pay more if those 0s and 1s go to video streaming vice e-mail. That is like paying more for electricity that powers your television than your lights. My analogy may not be exactly correct, but would like clarification where I am wrong. I do think most people ( and maybe myself) have an insufficient understanding of net neutrality. Any fool can explain a simple process in a complex way,(and quite often using big words), but it takes someone who really knows their stuff to explain a complex process by simple means. Well done Bob. I will definitely keep this one for reference purposes. Thanks Bob, beautiful article and I was always told it is P F M "Pure f-ING Magic". Correct use of words too? Bob wrote: "Those networks may be comprised of ..."
"Those networks may comprise ..."
"Those networks may consist of ..."
And THIS is why I subscribe to your emails....you take the complicated and explain it perfectly in such easy to understand "laymens" terms that anyone can understand it. BRAVO! This article is a perfect example of why I love your site.Thanks, Bob. Thanks Bob, another great article. WOW Bob, just WOW. Thanks and well done. Even already knowing (nearly) everything in your article, I confess that I would never be able to explain most of it as well as you did here. My utmost compliments, and admiration. Thanks, Bob! I had been aware of much of this (I sent my first email in 1992) but this is a marvellous explanation and history which I will save and refer to frequently. "AskBob readers, since they are smarter and better looking than the average Internet user"
such an observant & wise man this Bob is ! Nice article for those unfortunate non-Bob readers. Again another example of going above & beyond. As always your explanation of things is a real gift. I shall place this link onto my website under "Things of Interest." - If nothing else, at least we can raise the 'profile' of your so very helpful website.